Lighthouses have marked Fairport Harbor, Ohio since 1825 showing the entrance to the Grand River. 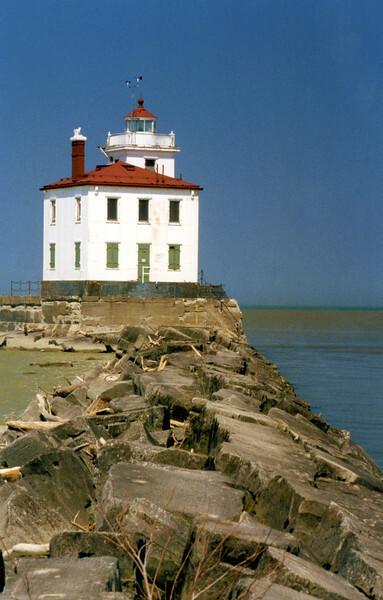 Over the years improvements were made to the harbor as a new lighthouse was built in 1871 and piers extended out into Lake Erie. Eventually it was decided to build a lighthouse on the end of the western pier to provide a better navigational aid for shipping. In June of 1917 Congress appropriated $42,000 to build the Fairport Harbor West Breakwater Lighthouse. Some of these monies were to be used to demolish the old 1871 stone tower; however public outcry led the Lighthouse Service to leave the old tower standing. It eventually became one of the nation’s first lighthouse museums.